Andreas Wisniewski, born in West Berlin, was a dancer before becoming an actor and appearing in Gothic (1986), Ken Russell's horror-drama about the origins of Mary Shelley's Frankenstein. Necros is one of Koskov's henchman, who appears in a number of disguises. Firstly, as a jogger, he kills a milkman using his Walkman as a weopon of strangulation! Then, having taken over the disguise of the milkman, gains entry into the MI6 safe-house to 'kidnap' Koskov. Most of Wisniewski's roles in other films and TV episodes have been small ones, many in German films of the 1990s, but he will always be best remembered for his character, Necros, in the James Bond film The Living Daylights (1987), with Timothy Dalton as 007. In 1988, Andreas Wisniewski appeared in Die Hard as Tony (a henchman of Hans Gruber played by Alan Rickman) who is killed in a fight with Bruce Willis' character, John McClane. The image in the lift, with Wisniewski wearing a Santa Claus hat, and with his shirt bearing the slogan "Now I Have A Machine Gun. Ho-Ho-Ho", is one of the most memorable in the film. 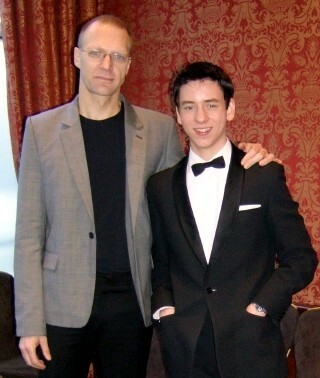 I met Andreas Wisniewski at Autographica in March 2007. He was very friendly and easy to talk to. He signed my Jeff Marshall lithograph of The Living Daylights and I had my photo taken with him. I asked Andreas what it was like doing Die Hard. His reply was, "Boring! I was needed for 10 days filming but for seven days I was just doing nothing, and for most of the other 3 days I was playing a corpse!" He enjoyed his Bond film role though as it was much more exciting to do! Finally, Necros gets his come-uppance when he tries to strangle Bond himself. The superbly filmed drama takes place outside a Hercules aeroplane in flight, with Bond and Necros clinging to a cargo net containing a large haul of opium. With Necros hanging on by just his boot, Bond eventually cuts the lace and sends Necros disappearing into the sky, and certain death. Several people are killed with exploding milk bottles before Necros changes from milkman to doctor to take Koskov to a waiting helicopter. Later, Necros disguises himself as a balloon seller in order to assassinate Saunders at an amusement park in Austria.